Models for this thinning with depth involve time, and the more realistic the ice flow model is the more realistic the model time-scale for a retrieved ice core will be. The number of annual ice layers from the ice surface to a certain depth z determines the age t(z) of the ice. The annual ice layer thickness a(z) is controlled by the ice flow, which depends on many parameters changing over time. Model time-scales therefore need a number of realistic assumptions in order to be useful. Under relatively simple boundary conditions and reasonable empirical information input, model time-scales can be quite helpful, but to judge their accuracy is not a straightforward matter. In fact a three-dimensional ice-flow model is not necessarily more accurate than a two-dimensional model; the extra information needed can be quite substantial and additional assumptions must be added to the model. The accuracy of model time-scales does of course depend on the circumstances, i.e. : is the ice flow relatively simple? How is the change of snow accumulation during the glacial cycle treated in the model? What flow law is used for the ice and is the the temperature profile of the ice sheet included? The model can also be confined by adding boundary conditions obtained from other studies. Model chronologies have the advantage that they deliver a date for any depth in the core. Also they can be modified easily if more precise or new input parameters later become available. The disadvantage is that a number of assumptions and simplifications must be included in the model; these eventually will determine the accuracy of the time-scale. The accuracy can in principle be estimated by changing the input parameters and assumptions within the margins determined by our knowledge on the possible errors related to these. The use of analytic models can be quite helpful in some cases, but such models cannot live up to the present demands of a high dating accuracy as they are based on too simplistic assumptions. 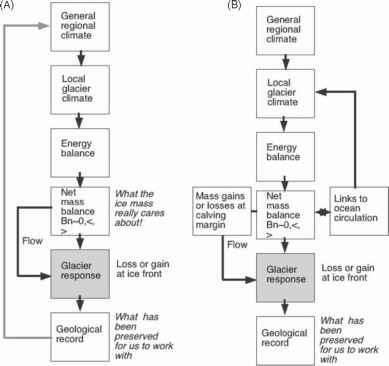 The interested reader can find useful information on such models in The Physics of Glaciers (Paterson, 1994).